Psychology undergraduate Marina Khalil represented University of Plymouth at the 2015 Posters in Parliament event. 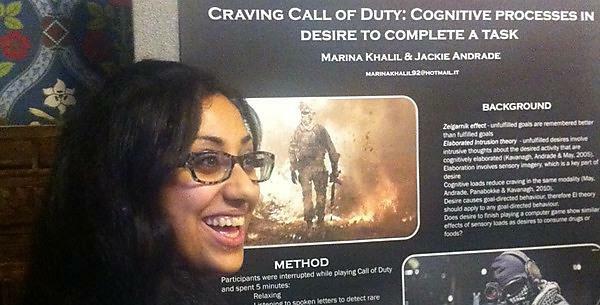 She presented a poster on her research into desire - specifically cravings to play the game Call of Duty. "I had a fantastic day out at Westminster where I presented my research in front of politicians and academics," said Marina. "This was a wonderful opportunity which I would not have had if it wasn't for University of Plymouth." ‘Posters in Parliament’ is an exhibition at which the best students are sent by their universities to present their work to the House of Commons and the Lords. This gives legislators and policy-makers the opportunity to see first-hand some of the innovative research taking place around the country. ‘Posters in Parliament’ showcases the work of the next generation of innovators and academics whose discoveries are already helping to further our understanding of the big challenges facing the world today. The event is organised by the British Conference of Undergraduate Research (BCUR), an open coalition of universities dedicated to encouraging a national culture of undergraduate research.